The IAM today announced that approximately 28,000 IAM members at United Airlines will receive major and much deserved pay increases. Base wage rates will increase by an average of 19 percent and will escalate by an average of 32 percent by 2021. Since 2014, IAM members at United have ratified 14 separate contracts that have increased wages for the vast majority of workers by approximately 40 percent, and by 2021 by about 55 percent. In April, the IAM and United concluded five months of limited issue, expedited negotiations. IAM members from six different collective bargaining agreements covering over 28,000 workers in multiple classifications at the carrier ratified new contracts. In addition to major wage increases, the new accords provide for a 25 percent increase to IAM members’ industry-best IAM National Pension Plan and unprecedented improvements to members’ job security. “I am proud of District 141 for providing the representation that our hardworking IAM members at United deserve,” said Pantoja. The IAM-United limited issue, expedited negotiations was one of the steps in a multi-airline strategy by the IAM to take advantage of favorable industry conditions to increase members’ wages, benefits and job security. An American Airlines interim wage agreement in July increased pay to industry-leading levels before negotiations are concluded. Negotiated contract language at Southwest Airlines provided $120 million in additional wages and lump sum payments mid-contract for IAM members at the airline. 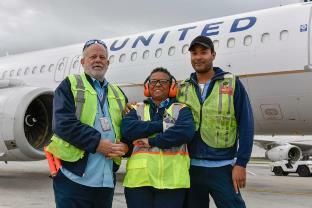 The IAM represents approximately 28,000 Fleet Service, Passenger Service, Reservations, Stockroom, Central Load Planner, Maintenance Instructor, Fleet Technical Instructor, Emergency Procedures Instructor and Security Officer workers at United Airlines and is the world’s largest airline union.